Our long national nightmare has nearly come to an end! 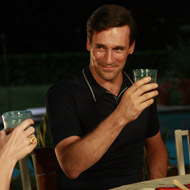 After a winter fraught with concerns for the future of the program, the premiere of the third season of Mad Men on AMC is now but a scant 37 days away. And, as you might expect, advertisers are lining up in droves to try to associate themselves with the aura of coolness that Don Draper radiates. Two of the biggest promotional partners helping to increase awareness of the program will be Banana Republic and Clorox; the former will be selling a line that echoes the style of suits that the Sterling Cooper crew wears, while the latter has created an advertisement that shows the effectiveness of their product in removing lipstick from shirt collars. Yes, that’s right, the normally family-friendly Clorox brand is going to be running a series of spots that features the tagline, “Getting ad guys out of hot water for generations.” Cheeky! That said, we’ll do our darndest to look past questionable branding initiatives if it keeps those extra two (formerly non-profitable) minutes of Mad Men in each episode.